The Creative Christmas Market is a new addition to Shanghai’s festivities calendar. It features a specially constructed, 150-square-meter outdoor ice skating rink to celebrate the holiday season. Around the ice rink are 20 vendors selling Christmassy gifts, food and drinks. Christmas is just two days away and it usually involves costly gift-buying, eating and drinking. For more variety and cheaper entertainment, here are two unusual events on the big day. Situated in a furnishings and lifestyle mall in Xuhui District, the Creative Christmas Market is a new addition to Shanghai’s festivities calendar. It features a specially constructed, 150-square-meter outdoor ice skating rink to celebrate the holiday season, New York-style. 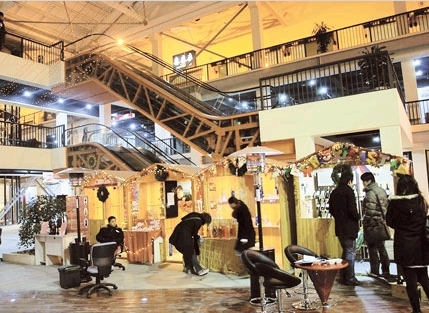 The rink is set in Wending Lifestyle Plaza, created out of a converted factory. The market is open daily through December 31. There will also be a real Christmas tree and live music. Around the ice rink are 20 vendors selling Christmassy gifts, food and drinks. “Many expats will remain here over the Christmas season, and have little variety other than the usual restaurants or bars. We wanted to do something different that has never been done in Shanghai,” says Zhang Ming, public relations director for the project. Use of the ice rink is 50 yuan (US$7.30) for two hours, and gifts from the vendors are individually priced. The vendors in faux wooden chalets will be selling artsy gifts, from bags to scarves. For food lovers, hot chocolate, mulled wine, gingerbread and sweets and nuts will be on sale. On Christmas Day, local jazz musicians perform in the Jazzstars Jamshow. Usually jazz is linked with bar culture, but the Shanghai Jazz Orchestra is raising the profile of local jazz musicians by taking them onto the formal stage of the Shanghai Concert Hall. The Chinese and expat performers will be accompanied by the Shanghai Jazz Orchestra. This is a monthly show that was started this September. Seats are just 50 yuan. The concert will be enlivened with experimental music. Since the events started in September, they have included Chinese and foreign performers, incorporating the harmonica and the traditional erhu (two-string fiddle) into jazz. Concerts in formal venues such as the Shanghai Concert Hall are usually very expensive, “so we want to break down barriers by putting on cheap concerts for just 50 yuan,” he says. All performances are also professionally videotaped and broadcast on youku.com on the orchestra’s formal space. “It’s a very open platform, and a good opportunity for local musicians to reach audiences worldwide,” says Dalu. Organizers say there will be a special performance in January, with a lot more participants and guest orchestras to celebrate the end of the year. Venue: Shanghai Concert Hall, 523 Yan’an Rd E.
This entry was posted in China - current affairs and news and tagged Chritmas, Shanghai. Bookmark the permalink.